For the treatment of tinea manuum,tinea corporis,tinea pedis, tinea versicolor, allergic dermatitis,psoriasis, atopic dermatitis, herpes zoster, acne,hemorrhoids. Clear abnormal mucus, bile fluid, swelling and itching. Creeping Euphorbia,Medicine Terminalia Fruit,Terminalia billerica Roxb,Scamania,Alose,Fructus Chebulae Immaturus,Excipients are: starch and magnesium stearate. For oral use after meals,3-5 tablets thrice daily or by medical ordor. 1.Digestive system: diarrhea, abdominal pain, bloating, constipation, dry mouth, nausea, vomiting, stomach discomfort, abnormal liver biochemical indicators, etc. 2.Skin and its accessories: rash, itching, redness, dermatitis and so on. 3.The nervous system:headache,dizziness,dizziness,facial or limb numbness. 4.Systemic symptoms:allergic reactions,fever,fatigue and so on. 5.Other:palpitations,chest tightness,bleeding and so on. 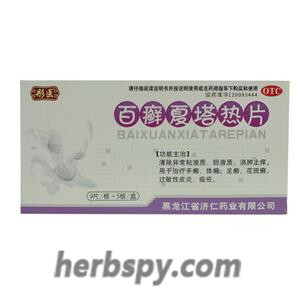 1.Contraindicated in pregnancy and lactation women. 2.Patients who are allergic to this product or its components should not take. 3.Suffering from chronic diarrhea, dysentery is prohibited. 1.Avoid alcohol and tobacco and spicy,cold, greasy,sea food during taking this product. 2.Abnormal liver biochemical indicators or has history of liver disease should be used with caution and should be taken under the guidance of a physician; patients with chronic diseases such as hypertension, heart disease, diabetes, and kidney disease should be taken under the guidance of a physician. 3.Patients with ulcer disease and infirm are used with caution. 5.Daily diarrhea more than four times during the medication should be reduced or discontinued. 6.In accordance with the usage and dosage,the product doesn’t apply to long term use. 7.Two weeks without any remission,or symptems aggravated,should go to hospital. Stage Food and Drug Administration Approval number:Z20093444.